Book a skilled lawn pro in Kansas City. Backed by a total satisfaction guarantee and amazing customer support. Lawn Love is lawn care made easy! 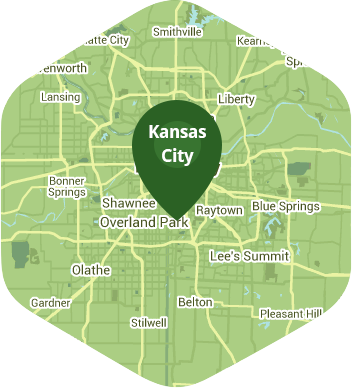 FREE and easy quotes on Kansas City lawn mowing services with a click of a button. Lawn Love is the #1 rated lawn mowing service in Kansas City. It's never been easier to book lawn care. Book now and find out for yourself. If you love good barbecue, historical sites, and some good jazz music, then Kansas City is the place to be. It has the most barbecue joints per capita in the entire country, and is even home to the best southern barbecue in the country in Joe's Kansas City. Food is not the only thing that makes Kansas City an awesome place to live in. The city is also home to more than 200 fountains, and has more boulevards than the city of Paris. You won't be able to enjoy this great city if you're going to be stuck mowing your lawn during the weekend. This is where you should call Lawn Love because we are one of the best lawn mowing service providers in town. Mowing your lawn is necessary as it helps keep your grass healthy. However, a lot of homeowners aren't exactly too fond of this particular chore because they see it as doing too much work. Regularly mowing your lawn helps keep the grass short, neat, and even. The short grass clippings that get left behind after you mow your lawn can even be used as mulch for your grass, which provides the soil with a natural fertilizer. At Lawn Love we take pride in using a tailor-made approach for every lawn we are hired to mow. We know every lawn is unique, so we want to make sure we are using the right approach to best meet the desired results. Our lawn mowing service is easy to book and can easily be managed through a computer or smartphone. You can call now at 816-527-9015 or get a quick quote online to know more about our services. The men were hard working and my yard looked so nice when they were finished.....Good service. Really thorough job. Thank you so much for taking care of us! Got all our leaves from landscaped beds in front & side yard. AND did a phenomenal job getting leaves out of backyard near our back fence. Really above & beyond! Many thanks! Great work, very courteous and the job was well done. Thank you! The yard looked great and did not skip anything. Jeffery checked in verifying the work needed and checked out letting me know about the ability to bid work in the back yard. Again, I wish I could give Emily all the great responses. Emily was outstanding. I asked him to clear the driveway. He cleared our walkway and steps, too.! She worked very hard and did a very good job on February 17, 2019. Have used this gentleman twice, and he has done an excellent job both times! I wanted to give Emily all the categories given to me to rate my experience of her clearing my driveway but it would only allow me one. All the terraced & landscaped areas of my yard were cleared of leaves, not just the grass. Thank you for the hard work!! I know where to go for future lawn care needs! She just did the most thorough job VERY quickly. They were so friendly and I would recommend to anyone!! Everything looked amazing when I got home! So convenient to be able to book online and know it’s taken care of! Charles is a really fantastic Lawn Pro. Always goes above and beyond. Always pleased with his work. Thanks! The front lawn looks great. Kudos to you for doing such a great job inspite of the weather. Thanks for servicing my lawn this summer. Jeff goes the extra mile to provide excellent service. Have you heard the news Jim does an excellent job every time...! Two thumbs up for Jim! Great customer service Jim! Has an eye for details! Thanks for the great job Jim! Chuck was amazing, knowledgeable, proficient and professional. Service was great this year. Enjoyed it. We won't be needing anymore service. I just needed it until I got our lawn up here. Very professional and kind. He did an excellent job- the area looks better than it has all year! Thank you!!! Did excellent job. Yard is cut very even. Edging along sidewalk was outstanding. Dylan did a fantastic job! This is the best my yard has ever looked, very thorough. Hope they will be back for all my lawn work. Like them and their work very much. Took the time necessary to do a great job! Jim did another excellent job on our lawn. We give him two thumbs up! He pays attention to every little detail. Thanks Jim for the great customer service....! Jim did a superb job as usual. Two thumbs up for Jim. Excellent customer service always. Ryan you do a great job! Thank you very much Ryan! Rated 4.76 / 5 stars in 2,023 Kansas City customer reviews. There won't be any rain in Kansas City today, which means you'll probably have to water your lawn. Dusk and dawn are the best times to water your lawn (the sun will rise at 6:37 AM and set at 7:58 PM today in Kansas City). Here are some average lawn care prices for homes in Kansas City. Average lawn size 6,275 sq. ft.